Icelandic winger Johann Berg Gudmundsson doesn’t want to play Russian roulette and leave World Cup qualification to chance this time. Burnley’s summer signing featured in his nation’s play-off against Croatia three years ago when goals from Mario Mandzukic and Darijo Srna in Zagreb ended the underdogs’ hopes of reaching the finals in Brazil. But Heimir Hallgrimsson’s side excelled over the summer when reaching the quarter-finals of the European Championships in France having beaten England and Gudmundsson is confident of carrying that momentum in to their Group I programme. Iceland are joined by Ukraine, who they took a point from in their opening fixture, Kosovo, Turkey, Croatia and Finland. “When you play in England and beat England, everyone is going to be asking about that, it was a great summer, but now I’m concentrating on Burnley and the World Cup because we want to be in Russia as well,” he said. “We want to go to Russia so these are important games. The first game was in Ukraine, which we drew, so it was a good point, and we need the points because it’s a tough group. “It’s the only group with four teams from the Euros, so it’s tough, but our aim is to go to the World Cup, because that’s where we want to play. “We qualified for the Euros and were in the playoff for the World Cup last time, so we’ve been around, and it’s about being consistent. “There’s a bit more respect for us, but we won’t change. We’ll stick to what we know and we’ll be alright I think. 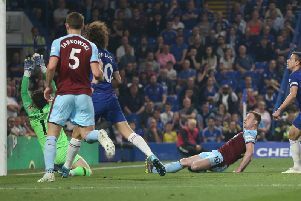 Gudmundsson accepts that his move to Turf Moor was perfect for him from an international perspective due to the similarities between the two. The 25-year-old former Charlton Athletic man believes the transition from club to country, and vice-versa, is a smooth process. “It’s a similar team, most of the time play 4-4-2, hard-working teams, so it was easy to slot into the dressing room, and it’s a similar dressing room as well,” he said. “It’s a perfect place to move to.